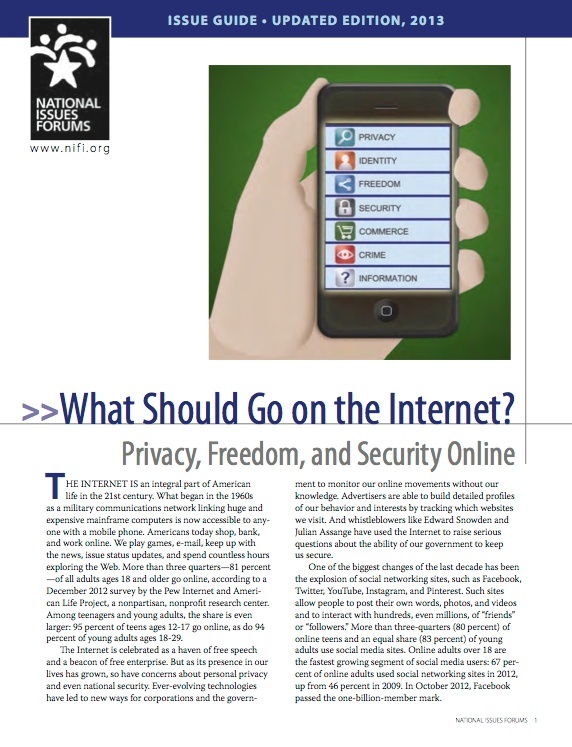 New Issue Guide From National Issues Forums: What Should Go On The Internet? The same Internet that has given us new ways to socialize, learn, and engage in civic life has also given criminals new avenues to steal from us and scam us, often using information gleaned from public government documents now posted online….And because no one’s in charge, there’s no single authority we can call to complain. When does our personal information become public? What data collection is acceptable? Should there be limits on what we can do online? It’s time to find a way to balance our needs to safeguard privacy, preserve free speech, and ensure security for all our citizens, young and old. It’s time to answer the question: What should go on the Internet? Privacy is a fundamental American value. But the Internet has obliterated the line between public and private, forcing Americans to live in a virtual fishbowl. Our top priority must be to safeguard personal information on the Internet. The Internet is a revolutionary leap forward for democratic societies and free markets. Direct or indirect censorship by concerned citizens, special interests, or government could stifle this great resource. The Internet is a Wild West of criminal activity that threatens our personal safety, our economic vitality, and our national security. Our top priority must be protecting our children and ourselves. Click here to order these issue materials.